As an analyst, these two tables were really heartening to see. David Ogilvy famously stated, "We sell, or else" and objectives for the shortlisted entries are dominated by sales metrics and by proven uplifts to those metrics. 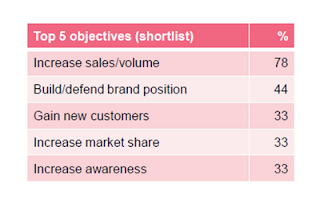 78% of shortlisted entries had "Increase sales" as an objective, compared to only 40% of entries as a whole. Unless combined with a sales link, "Increase Awareness" - the most common objective for all of the entries - is dangerously close to that classic woolly objective, "make a noise", which to be honest I usually read as "waste some money". We sometimes think that award winning ads and effective ads aren't necessarily the same thing, but it looks from this paper as if we sell, or else don't win awards too. Note the relatively low number that target increased sales and also social / non profit creeping in at #5. And top 5 objectivesfor the shortlisted entries.